The Georgia Southern University Betty Foy Sanders Department of Art will present work by the late sculptor Lew Alquist from Sept. 26 – Oct. 28 in the Contemporary and University Galleries at the Center for Art and Theatre. 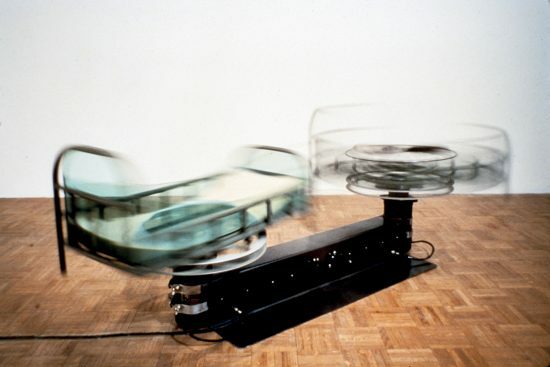 Alquist incorporated found objects, kinetic energy, sound, and scent into his work—provoking the senses to make the invisible more visible. His work primarily examines similarities, parallels, overlaps, and adjacencies between technological development and human evolution, but it also points to issues of political and industrial corruption as relevant today as when the work was created, in the 1970s-1990s. A presentation on Alquist’s work will be given during an Artist Talk on Friday, Sept. 30 at 5 p.m. in Visual Art Building, Room 2071. A reception will follow from 6 to 7:30 p.m. in the Center for Art & Theatre. All events are free and open to the public. Alquist’s wife Jane Pleak, who taught ceramics at Georgia Southern for nearly 30 years, curated the exhibition. In honor of Alquist, Pleak started a memorial fund to help the BFSDoArt bring visiting artists to the University to enhance student learning through workshops and lectures. To contribute, go to GeorgiaSouthern.edu/Art and choose “Make A Gift” from the right sidebar. Designate your gift by selecting “other” and typing “3694 Lewis Alquist Visiting Artist Fund” in the processing instructions.